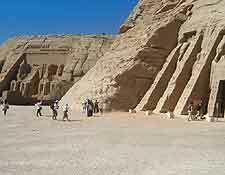 A fairly small settlement located directly south of Aswan and very close to the Sudanese border, Abu Simbel is a relatively unassuming village, with a number of simple office buildings and eateries, of little interest to tourists. However, Abu Simbel is also home to two truly colossal temples of quite epic proportions, the Temple of Ramses II and the Temple of Hathor, both of which were cut into the side of a rock face. However, not only are the temples of Abu Simbel quite breathtaking, but their long history is really equally fascinating to tourists. Dating back more than 3,000 years, the future of these temples was in jeopardy in the 1960s, when the creation of Lake Nasser was planned, since the rising floodwaters would have engulfed them completely. The Egyptian government and UNESCO discussed various possible methods of saving these temples, with architects from around the world submitting detailed plans and information, which even including covering the Abu Simbel temples in a giant underwater glass bubble and connecting it to the surface by a lift. However, in the end, it was decided to simply cut the temples into over 2,000 different blocks and then reassemble them nearby, alongside the planned lakefront. An artificial mountain was built and in just four years, after considerable work and care, the Abu Simbel temples were successfully relocated to their present site, subsequent saving the village's tourism industry at the same time. Apart from Abu Simbel's famous temples, the spectacular man-made Lake Nasser offers an array of recreational activities. Lake Nasser is one of the world's biggest artificial lakes and was created in the early 1970s, after the completion of the Aswan High Dam. The lake shore next to the village offers a number of scenic cruises and fishing trips, which afford some awesome views as you sail around on your boat. 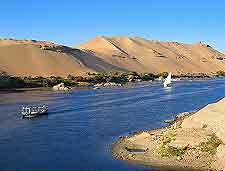 If you are very lucky, you may even spot an Egyptian Nile crocodile. Although the temples of Abu Simbel were saved from their watery grave beneath Lake Nasser, along with more than 20 other important ancient sites, some smaller temples have been lost forever. 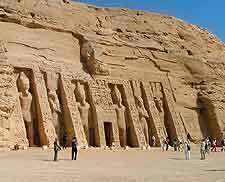 More information about Abu Simbel Tourist Attractions. The Temples of Abu Simbel were actually lost beneath the desert sands for many long centuries, with no record of their existence. However, around 200 years ago, one of the statue heads appeared once more above the sands and was spotted by a passing Swiss explorer, being carefully excavated soon after. The Temple of Ramses II is the main draw card here and tourists visiting Abu Simbel will find four giant statues of the Pharaoh guarding the entrance. Somewhat smaller but still very impressive, the Temple of Hathor is dedicate to the king's wife, Nefertari. 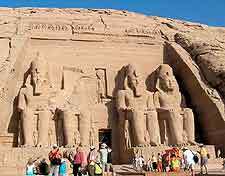 More information about Abu Simbel Temples. The temples of Abu Simbel are really like a giant museum and offer a real insight into how Egyptian gods were worshipped and revered. As you step inside, this admiration is enforced by the countless reliefs, frescoes and hieroglyphics, which adorn the walls and columns of the temple, depicting various scenes around Abu Simbel, often featuring both King Ramses II and his stunning wife, Nefertari. Look closer and you may even spot some 19th-century additions, added by the brave archaeologists who discovered the temples. More information about Abu Simbel Art and Reliefs. Tourists often come to Abu Simbel as part of a tour around southern Egypt, with many surprising temples and ancient monuments relatively close by. 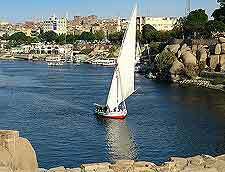 Aswan is just about near enough to make a day trip possible and boasts some famous sights, such as the Philae Temple, the Tombs of the Nobles, Elephantine Island and the gigantic Unfinished Obelisk, which remains part-carved and still in the quarry, being abandoned many centuries ago after a serious crack appeared. Somewhat closer to Abu Simbel is the Temple of Wadi El Sebua and the Kalabsha Temple, both of which were relocated in the 1960s, being sites away from the floodwaters of Lake Nasser. 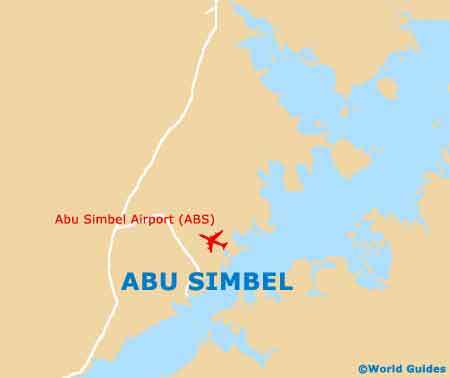 More information about Abu Simbel Attractions Nearby.